People who have extra pounds around their waist are at higher risk of suffering health conditions than the individuals who have extra weight around their hip area. To identify your waist circumference, you need to measure your waist circumference and hip circumference in inches and divide both of them. 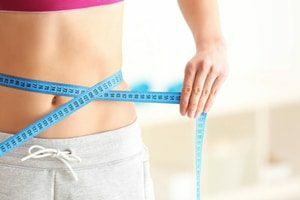 This ratio helps you in determining your body shape and lets you know that whether you need to eat more or take extra steps to avoid being obese. If your WHR is above 0.80, then you are referred to as apple shape, but if your WHR is more than 0.80, then you are pear-shaped which is healthy. Waist-hip ratio or waist to hip ratio is considered as the dimensionless ratio of the waist circumference to the hips. 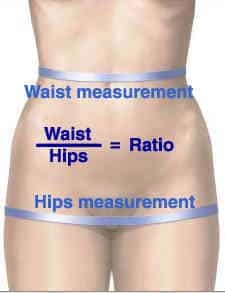 The waist-hip ratio can be calculated by dividing the waist measurement with hip measurement. For example an individual with 76cm or 30-inch waist or 97cm or 38 inches hips so the waist-hip ratio equals to around 0.79. WHR can be used as a measure or an indicator of health, along with the risk of development of severe health conditions. WHR is associated with fertility (measures the different optimal values for both women and men). According to WHO protocol, you should measure the waist circumference at the midpoint starting from the lower margins of the rib which is the last palpable one ending at the top portions of the iliac crest with the help of the stretch resistant tape providing a constant 90-100gm of tension. You should measure hip circumference at the most extensive area of your buttocks keeping the tape parallel to the floor. Other organizations such as National Health Nutrition example Survey and National Institute of Health have different standards of measurement sample from the tip of the iliac crest. Laypersons measure the waist at the navel, but these measurements underestimate the waist circumference. For both the types of analysis, it is advised that individual should stand in a position with closed feet, arms placed on the sides, with body weight equally distributed and wear less clothing. Feel relaxed and measure the waist to hip ratio when you need the regular cycle of respiration. Repeat the measurement twice, if the difference between both the measurements is less than 1 cm calculate the average, however, if there is a difference of more than 1cm repeat both the measures. You can directly measure the waist-to-hip ratio by dividing the waist measurement with hip measurement. For example, you have 32 inches of waist, i.e.,.81.4cms, and you have a hip measurement of around 42 inches, i.e., 106.6cms, the equation would be 81.4/106.6 which equals to 0.76. 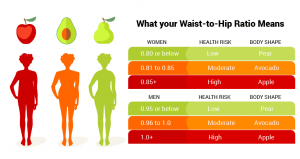 A waist-to-hip ratio of around 0.86 is considered unhealthy or dangerous for females while 0.95 is seen as dangerous for men. 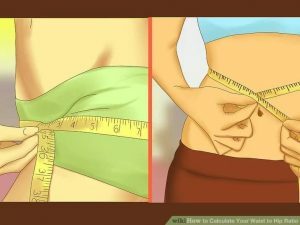 Practically measure the waist conveniently around the smallest circumference of your natural waist usually above the belly button and hip circumference measured around the widest part of hips and buttock. If your waist is in convex instead of concave shapes such as during pregnancy, obesity or other body types, measure the size on a horizontal level 1 to 2 inches above the navel. WHR is used as a measure or indicator of health, developing the risk of severe health conditions. Individuals with apple-shaped bodies have more weight around the waist area possessing more health risks when compared to pear-shaped bodies which have more weight on their hips. WHR is also used as an indicator for obesity measurement which is used to measure the severe health issues. According to WHO, abdominal obesity is referred to as waist-hip ratio above 0.85 for ladies and above 0.9 for men or a BMI measuring above 30.0. According to the National Institute of Diabetes, Digestive and Kidney disease, women who have WHR ratio of 0.8 or above and men with WHR ratio of 1.0 or more have more chances of developing serious health problems because of the fat distribution. WHR is a useful predictor of the death rate in older people with age of around 75 years or more than BMI or Waist circumference. If you redefine obesity using WHR rather than BMI, the people categorized for heart attack risks increases three fold. The more accurate way of measuring relative weight is by using body fat %. WHR is the only measurement that tells the difference between the body structures. Hence, there are chances that two women with same Waist-hip ratio having different body mass indices or they have a different waist-hip ratio but same body mass index. WHR is a better predictor to assess cardiovascular disease than BMI and waist circumference. Other studies indicate that waist circumference is a good indicator to evaluate heart disease, hypertension in patients with type 2 diabetes and body fat distribution. If you are an apple shape, you will tend to carry more weight in the upper torso, waist, and abdominal area. People who are apple-shaped are at a higher risk of heart disease and diabetes. People who are pear-shaped will carry more weight in the thighs and buttocks. In fact, storing fat in the lower body can protect you against cardiovascular disease and atherosclerosis. Women within the 0.7 range are less likely to be affected by type 2 diabetes. A study found that WHR is more effective at predicting cardiovascular disease than BMI or waist circumference. According to the study, women with a WHR of over 0.80 have lower pregnancy rates than women with lower WHR. The waist-to-hip ratio is an inexpensive and easy way to assess the nutritional status of an individual. The waist-to-hip ratio cannot be used to calculate the waist circumference in pregnant women because it expands as the baby develops. It cannot be applied to individuals who have recently undergone liposuction surgery of the hips or waist as the ratio will be the false results. This ratio will not give you accurate results if you have eaten your meal recently as the liquid and foods within your stomach cause the expansion of your waist and increase the circumference artificially. WHR is not necessarily used to measure the abdominal fat mass instead it is used to measure abdominal fat in association with the lower body weight. An ideal WHR ratio is an indication that you are exercising and eating in appropriate amounts. If according to the results you are underweight so you should eat nutritious food and gain weight but avoid eating fattening foods to put on weight quickly. If you are overweight, you are at a risk of developing type 2 diabetes, osteoarthritis, heart disease and high blood pressure. Try to reduce calorie and sugary foods intake in your way of life. Avoid eating fatty foods to achieve a healthier body fat percentage and waist-to-hip ratio. Healthy eating helps to reduce the body weight. Eat meals in small proportions to avoid any weight gain. Enjoy all the three meals which include breakfast, lunch, and dinner. Include fruits, vegetables, fibers in your diet along with low carbs. Add omega-3 fatty acids to your diet which come from salmon, swordfish, canola oil and walnuts. Choose right carbs which are present in vegetables, fruits or lean proteins. Avoid eating late night meals and eat nuts in your snacks instead of chips. Anxiety promotes visceral fat by triggering the production of the stress hormone cortisol, which contributes to fat storage in the middle. You can try to find ways to eliminate anxiety from your life, such as taking part in yoga, meditation, or breathing exercises to fight stress. Initiate with a push-up position, but your elbows should be placed on the floor. Keep your torso and knees in a straight line with your body. Keep your head in relaxing place while looking down on the floor. Take a break for10 seconds and start your work up again. Lie down on your one side and rest your hand while stretching your arms. The other arm should be placed in front of your body while palms are facing downwards. Straighten up your legs and lift your top leg as high as possible. Then take a break and return to the initial position. Lay down on the floor and hold a weighted plate over your chest. Bend your knees at a 90-degree angle while feet are touching the floor. Keep your chin towards the chest and sit up all through the way. Hold yourself in a push-up position and move your arms and legs apart as far apart as possible so that your body makes a star shape. Hold this position of r 30 seconds with abs braced and torso straight. Use both of your hands and hold a medicine ball in front of your chest while you sit on the floor. Provide support to your feet with a sturdy thing so that your feet are anchored. Lay back on the floor away from the concrete wall or brick. Explosively sit up and throw the ball towards the wall and catch it while it bounces back towards you. Hold your feet in foot cradles and keep yourself in pushup position with hands placed on the floor. Drive one knee towards your chest with other leg extended. Now repeat it with the opposite leg. Continue this as if you are running in a single place.